The Urban Speakers Corner, a space for creative and dynamic exchange, took place in parallel with the Exhibition. 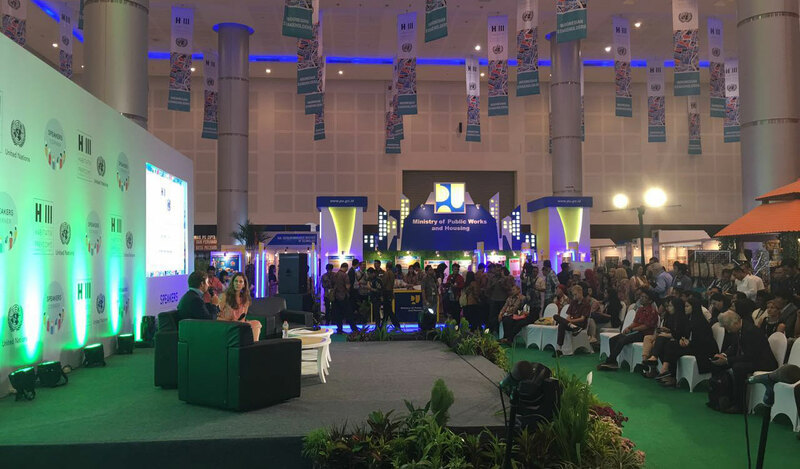 A stage was set up at the centre of the Exhibition Hall and welcomed speakers throughout the three days of PrepCom3. The Urban Speakers Corner hosted a total of more than 100 speakers, including Dr. Joan Clos, Secretary-General of the Habitat III Conference; H.E. Mr. Basuki Hadimuljono, Minister of Public Works and Housing of the Republic of Indonesia; H.E. Ms. Zou Kota-Fredericks, Deputy Minister of Human Settlements of South Africa; as well as representatives of the UN system, mayors, and other stakeholders. Habitat III conceptualised the Urban Speakers Corner with the aim of advancing discussions on housing and sustainable urban development.